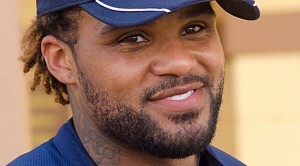 Michael Stein of FantasyAlarm.com paid $19 for Prince Fielder, hoping for a return to glory for the big man. This mixed league functions much like the Tout Wars and LABR fantasy baseball industry leagues. It’s a standard 5×5 Rotisserie league (though Tout now uses OBP instead of our traditional AVG). We run FAAB at 11 am on Saturdays so you can see the results to prepare for your own Sunday night FAAB (and also 11 am on Mondays in case of any Saturday or Sunday injuries). In this draft, I ended up with Kershaw at $37, didn’t plan on it, but was happy with the value there and focused most of my remaining budget on hitting after nabbing a top reliever in Betances ($16). I never go into an auction with a set amount that I want to spend on hitting or pitching. I just have a general idea due to the fact that every auction is different based on when the player is thrown out, remaining players to be bid on, other team’s roster construction and perceived values on individual players/tiers/roto categories. This is never more true than in mixed auctions, so I wanted to have a nice mix of power (Moss, Gattis, Ortiz, Cespedes), speed (Alexei Ramirez, Billy Hamilton, Brantley,Stubbs), and upside (Hanley Ramirez, Bauer, Giles, Duffy). I can also stash Jose Fernandez and use the bottom of my roster/bench for waiver adds. There were no real eye-opening overpays that I could see on the surface, the draft went pretty evenly, and it should lend to a competitive league. This year I violated a couple of my strategic principles (principally, exceeding my roughly 2-to-1 hitting-pitching budget); then again, I feel it’s a mistake to enter any draft — but especially an auction — with a rigid approach. Adaptability is key, which is why I tend to hang back in the early rounds to get a sense of pricing (and as often happens, let others overspend). I’m comfortable allowing a few owners to dictate early pricing — like CDub (who ended up with a classic Stars & Scrubs team, strong on hitting but weak on pitching) — because I do remain aware of tiers and available talent. That said, I was shocked to find I’d spent $112 on pitching. In my “defense,” A) the raft of recent injuries drastically thinned the “sure thing” pool, B) leagues like this without an IP max tend to enhance SPs’ value, and C) unsurprisingly, once Kershaw was off the board, there were amazing bargains in pitching. This is in part due to the lack of enforcing (something I prefer to let others do, but eventually bid some players up myself). Indeed, bidding was often more spirited toward the endgame since several owners ended up with spare cash. I did stick to my strategy of not exceeding $30 on any selection, preferring a balanced approach that ensures I’ll always have money to adjust and bid on desired players. Indeed, I only spent more than $20 three times (Scherzer, Puig, Chapman) — and I project them to earn back the expense and then some. The only questionable choice might have been Chapman at $21, especially since I don’t like to be the pacesetter on any given position. But he exemplifies my goal to obtain high K9, low-ratio guys (I also secured Miller and Boxberger for $5 total, both of whom should vulture saves if not end up as closers… I like to acquire a couple of “ace” middle relievers — though the strategy tends to pay off slightly more in leagues permitting daily lineup changes). And if I end up “overpaying” a couple of times, I don’t mind. I have the money in the bank, can’t take it with me, so as long as I snag players who produce the desired results, I’m satisfied. I like my team for the most part, though it’s not so much Stars and Scrubs as Tots and Vets. My hopes hinge on far more young relatively untested players than I’d like, which is why later on I didn’t bid as aggressively on potential post-hype sleepers like Bogaerts. Case in point: Kris Bryant. Still, it’s looking increasingly likely that he’ll be in Chicago by late April while I pegged Headley for a modest comeback. So either I paid $22 total for just Headley circa 2013 or, best-case scenario, I’m getting the 2012 Headley plus five months of 2017 Kris Bryant because he immediately fulfills his vast potential. I think the reality will lie somewhere in between, paying a pretty good profit by year’s end at two corner slots. Likewise, I was delighted to obtain Rougned Odor for $4 and even Kolten Wong for $12. Look, I love Rendon and Cano but they went for $25 apiece. Paying so little for so much upside at 2B/MI enabled me to spend more aggressively when and where I needed to. My only “mistake” bid was Everth Cabrera, but that was due to tech glitches in the ESPN template (I suspect I’m not the only owner who nominated or bid on the wrong player). It didn’t concern me since he cost a buck and I earmarked him as a drop. Since my biggest concern is power, I’ve already substituted Ryan Howard via FAAB. AVG is my other potential Achilles, but with MLB figures trending sharply down the past few years, .270 is the new .290 in fantasy. Otherwise, I think I have a balanced competitive team with potential assets to trade in speed and saves. The latter is crucial, because more and more savvy owners draft closers-in-waiting, so punting saves is a less viable strategy IMHO than it used to be. I am really, really pleased with my pitching. Carrasco, Gio, Shields, Gray, Kennedy, and Fiers for a total of $67. That’s really something. I really like all of those guys this year and don’t think I had to “fill out” my rotation with lesser guys… Even Fiers, who is banged up, is a stud and a threat for 200 K’s. At RP I got Casilla, Mujica, Soria for $6 plus a few $1 fliers like Ottavino, Parnell, and Farquhar. Hoping to patch together a cheap but effective pen. The offense is really strong too, with Abreu, Chris Davis, and Pujols at the corners… Reyes and Gordon up the middle… and an outfield anchored by Adam Jones and starring a $13 Jorge Soler. I waited forever to nominate Soler and I think I picked my spot pretty well on him. I need depth in the OF and a new MI with JJ Hardy on the DL… plus I have my doubts about the McCann/Grandal duo… but overall I’m really pleased. I did an entire write-up on the draft (URL below). I discussed my overall strategy and the possible strategies of other owners in the draft too.